A Quilt for All the Senses | Canberra Quilters Inc.
Only 7 sleeps until The Canberra Quilt and Craft Fair! Are you as excited about it as I am? 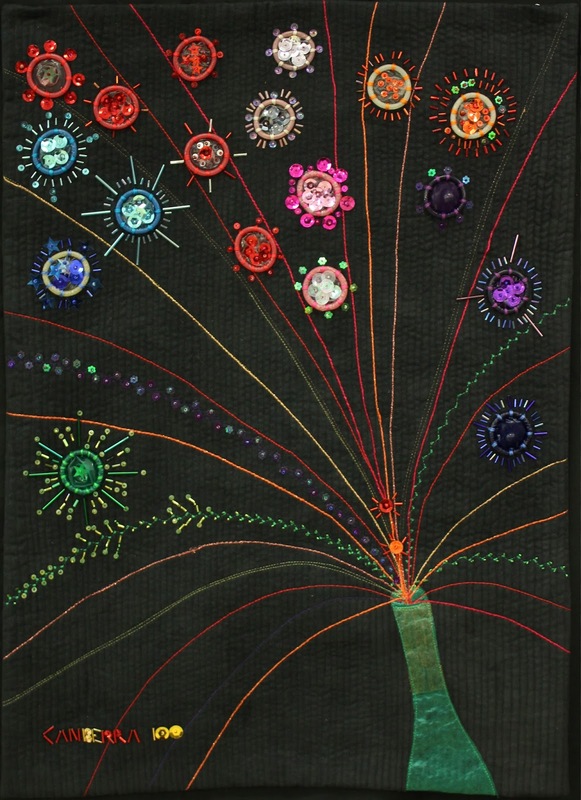 The quilt in question makes great use of an unusual embellishment; condoms. It’s an inventive way to add some excitement and colour to a quilt that’s for sure. Early bird tickets will be available at this evenings meeting for $11. Tickets are valid for entry on any day of the Fair. Raffle tickets need to be returned by 10 August and can be returned at this evening meeting (or at the Exhibition) to the Raffle Coordinator, Melinda Coupland Thorne. If you’re available on Wednesday to help with the set up of the Exhibition we’d love to hear from you. Please let Raylee Bielenberg know.